Spear top fencing is a great option for any property. It looks great, it’s sturdy and it’s cost-effective. Whatever you need your fence for, whether it’s to give your home an attractive border, or keep your pets and children safe from a swimming pool, spear top fencing will give you an option that will last for decades. Everlast Services have been involved in fencing for over 20-years. Not only are we the premier fence installation service we also look after all the design and fabrication from our factory in Hopper’s Crossing. This gives us unparalleled control over the quality of our products. By cutting out the middleman, we can also keep prices low and give you unbeatable provide unbeatable quotes. Everything we do is centred on keeping our customers happy and providing them with a fence they can rely on for decades. If you want a fencing contractor that will be with you every step of the way, you need Everlast. We love the local community, and we show this by giving back wherever we can. We’re 100% Australian owned and operated and we source everything we can from suppliers. We truly believe in supporting the local economy and believe that every dollar you spend with us should stay right here. Quality doesn’t have to come at a price. We don’t inflate our prices because we want to make our services available to as many people as we can. Our spear top fences are of the highest-quality, but we make them ourselves, so we don’t have to put the prices up. We’ve been doing this for 20-years, so we know what you need. We’ll provide you with a design that suits your property and your budget, and we’ll never suggest anything you don’t need. 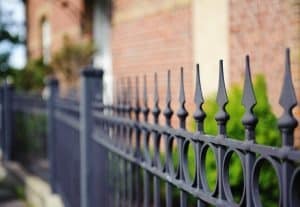 If your home improvement project needs more than a fence, you’ll be happy to know that we offer the full suite of services. Whether you need some landscaping, paving, decking or concreting, we offer them all with our famous Everlast commitment to customer care and quality products and services.